Australia’s national debt is counted as the debts of the government of the Commonwealth of Australia. The debts of Australia’s states are not included. The account of debts is limited to loans and financial instruments undertaken by the government. Not all obligations are included in the national debt. The table below clarifies what is and isn’t included. Who manages Australia’s national debt? The Department of the Treasury in Canberra is responsible for raising money for the government and managing its debt. The minister who heads the department is entitled Treasurer of Australia. The division of the Treasury that is specifically tasked with debt management is called the Australian Office of Financial Management. The activities of the AOFM are governed by the Loan Council. This controlling body includes the Prime Minister, the Premier of each state and the Chief Minister of each Territory. So, the central parliament of Australia does not have the final say on the amount of debt that the government runs up — the states also have an interest in debt and can outvote the national government on its debt strategy. One of the main mechanisms of control that the Commonwealth parliament has had over the Australian national debt was the debt ceiling. This was created by legislation in 1911, but not actually implemented until 2007. 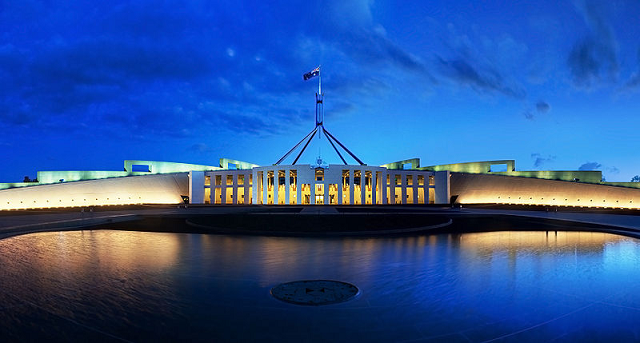 Although the Treasurer of Australia was formally obliged to ask the parliament’s permission to raise the ceiling, a government cannot be formed in Australia without a majority in parliament. Therefore, the party that the Treasurer belongs to always has enough votes to carry his wishes through. Thus, the debt ceiling mechanism was never more than a rubber stamp and was abolished with little effort in 2013. How does the Australian government raise loans? The difference between Treasury bonds and Treasury notes is that bonds are issued for a period of one year or more and Treasury notes are issued from periods between one month and one year minus one day. In other countries, Treasury notes are called “Treasury bills” or “T-bills.” Australian Treasury notes nearly always have a maturity period of six months or less. They do not earn interest, however, they are sold at a discount and the government redeems them at face value. Treasury indexed bonds have their face value increased each year by the inflation rate indicated by the Consumer Price Index. Investors receive the same interest rate throughout the life of the index-linked bond, however, they will receive more money as time progresses because that interest is applied to a higher capital value. The repayment on maturity is of the increased amount adjusted annually by the CPI and not the face value of the original issue. Standard bonds pay out every six months and index-linked bonds pay out quarterly. Australia’s debt to GDP ratio is assessed by the IMF at 41.6%. This is very low and, combined with other factors, makes Australian government debt an attractive investment for the international financial community. As a result, foreign ownership of Australian government bonds has always been very high. The graph below shows the total value of all debt instruments issued by the government of Australia over time and the proportion that was bought by foreign traders. The government of Australia has never defaulted on its debt and its bonds are AAA rated by all of the major credit ratings agencies. These factors make Australian debt instruments very safe investments. What facts should you know about Australia's national debt? You could wrap $1 bills around the Earth 1,711 times with the debt amount. If you lay $1 bills on top of each other they would make a pile 47,989 km, or 29,819 miles high. That's equivalent to 0.12 trips to the Moon.